It will pan out well in the long run. If you can trust yourself and prepare to persevere for exactly 1 year, your career will take off like magic. This one year will be hard but extremely rewarding and you will see how. But first, let’s fix the way you feel right now. 1. 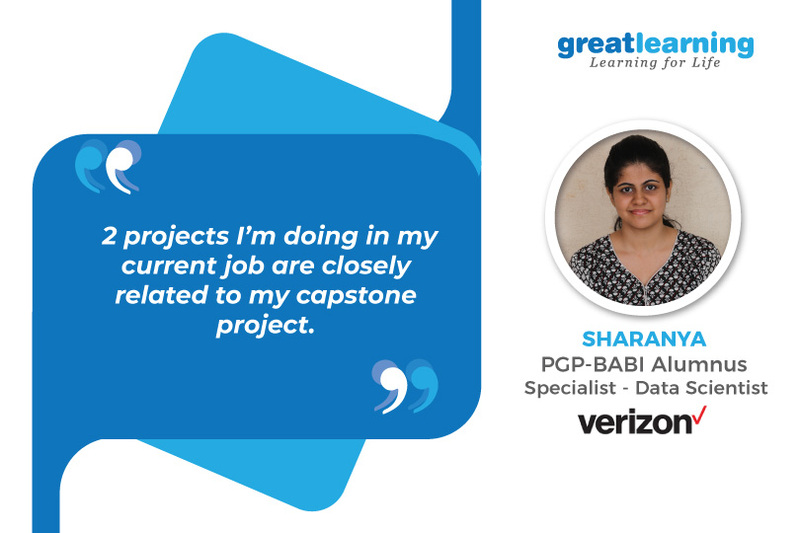 The Time You are Devoting in Your Capstone Project Today will Reap a Ton of Benefits Later – You have been thinking how you have taken an additional amount of time to just choose your domain, topic for the capstone project, and your mentor. But be rest assured and listen to your instincts. You know what you are doing. When you later get a new job at Verizon, you will do not one but two projects closely related to your capstone project. I can tell you that it will help you impress your teammates, managers, stakeholders, alike. Your mentor, Dr. Monika Mittal, will guide you way beyond your capstone project and you will develop an excellent relationship with her. 2. The Professors in the Class Who Seem Intimidating at First are the Most Impressive Set of Faculty Members You Will Ever Meet – You haven’t been in a classroom for a long time and studying may seem disillusioning right now. But give your professors a chance and see how their energy and creativity will grow on you. 60% of the course will be taught by industry experts and 40% by faculty members offering you the best of academia and industry viewpoints. Later when you are done with the program, you will still stay in touch with Mr. Raghav Shyam (Tableau) and Mr. Tushar Sharma (Web & social media analytics) and reach out to them for doubts in your current role at Verizon. You will reminisce about Dr. R.L.Shankar’s Ted talks, Dr.PKV’s support throughout the course, and how Dr. Bhardwaj will make everything simple for you to understand and have the most interesting classes planned. 3. You are Adding More Members to Your Friend List – Networking will be an extremely important aspect of pursuing this course. You may think how one class a month will let you develop any sort of relationship with your peers, industry mentors, faculty, and speakers. But this feeling will be limited to your first few interactions only. You will time and again reach out to these people even after you transition to analytics completely with Verizon. You will call them not only for doubts but because you would have become a strong part of the analytics community that seems distant and detached right now. 4. Focus More on Developing a Business Acumen than Learning Tools – Your professors will say that in the very first session and you will find it bizarre. You already know analytics and its application in the telecom sector. Why wouldn’t tools be important, you would think? But your professors are right! Just learning tools will not help you get into a techno-functional role or switch domains from telecom. It will require exposure to different domains and a deep understanding of how to derive business value by using analytics. You will unlearn to learn and this time it will be worth the effort!